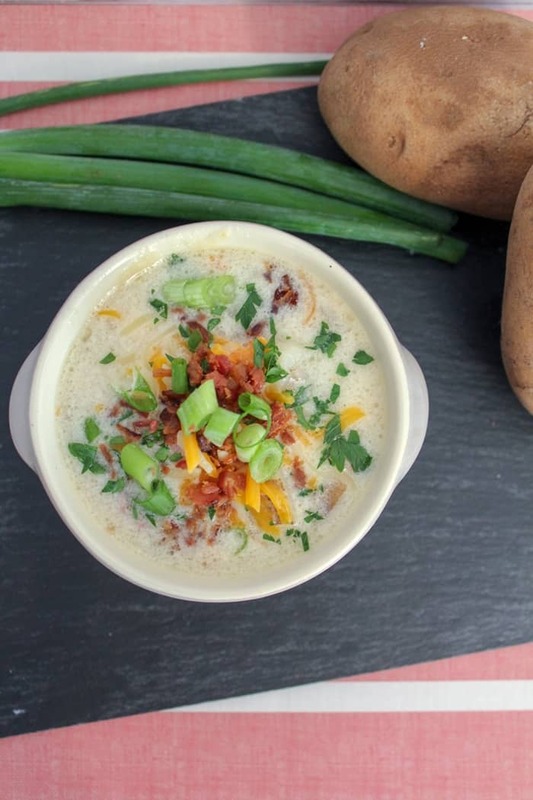 This quick and easy instant pot potato soup recipe put a warm and hearty meal on the table in under an hour that the entire family will love. Soup season has officially begun! 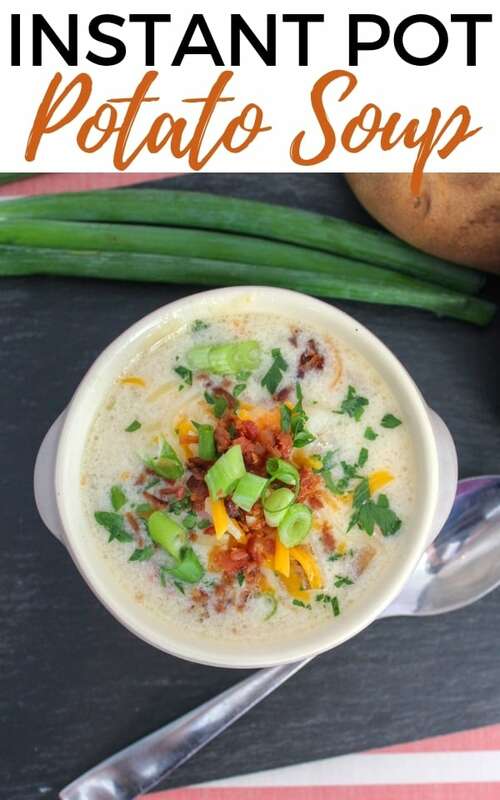 If you are like me and go crazy for Panera Baked Potato Soup, you will love this quick and easy Instant Pot potato soup recipe. 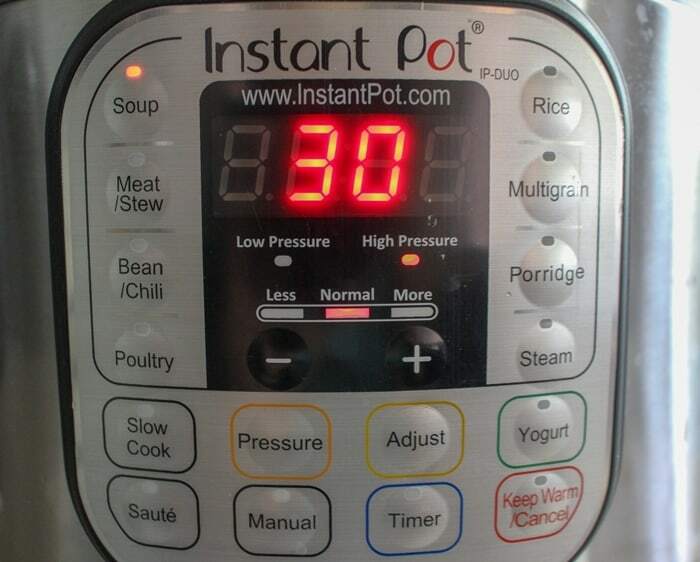 When you want a delicious pot of soup, simply bust out your Instant Pot. It sure beats standing over a hot stove or waiting all day for soup to cook in your slow cooker when all you want is a nice, warm bowl of soup. Don't miss our #1 Instant Pot recipe: Instant Pot Shrimp Scampi. 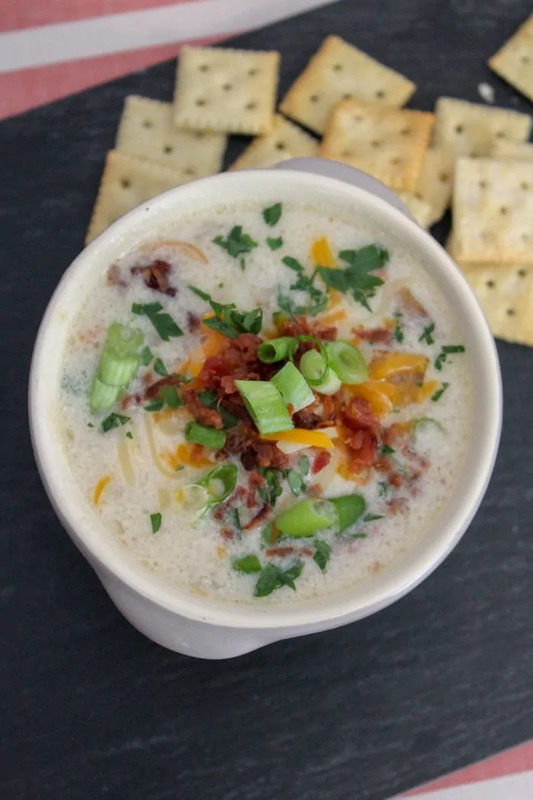 Instead of waiting hours for potatoes to cook in your slow cooker, you can make an entire batch of potato soup in the instant pot in less than an hour. And that includes the prep work! 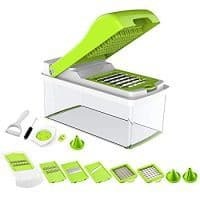 To make chopping all those veggies easier, try using a veggie dicer like this. It made the prep work super simple for us. 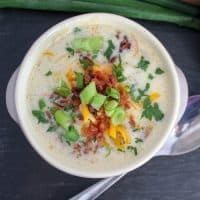 This instant pot potato soup is so rich and creamy. I mean with ingredients like bacon and heavy cream, how could you go wrong? It is a good idea to print out this recipe and keep it handy. That way you will be able to whip the recipe out when unexpected company stops by. It’s also a perfect recipe for potlucks and all the dinners you know you will get invited to during the holiday season. 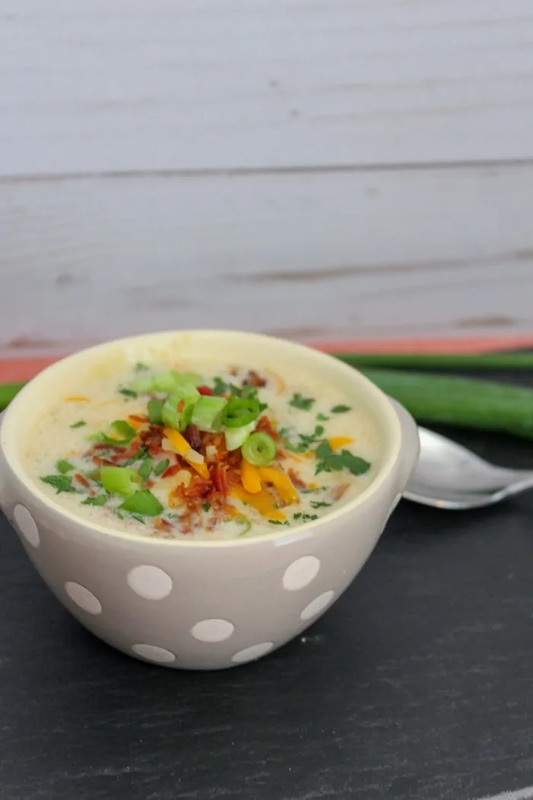 A quick and easy instant pot potato soup recipe that will put a warm and hearty meal on the table in under an hour. Add potatoes, celery, carrots, onions, scallion, bacon, salt and pepper, and heavy cream to the Instant Pot. Add water until all ingredients are covered. Stir well. Close the pot. Cook on Soup setting for 30 minutes. When it has finished, allow the pressure to release slowly and remove the lid. Serve in soup bowls. Top with cheddar, scallions, and crumbled bacon, if desired. This soup does look scrumptious, and only an hour! 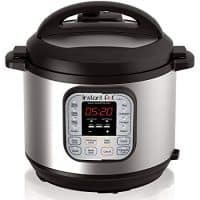 I need to ask Santa for an Instant Pot! This looks and sounds so good! How awesome that it is done so fast!? 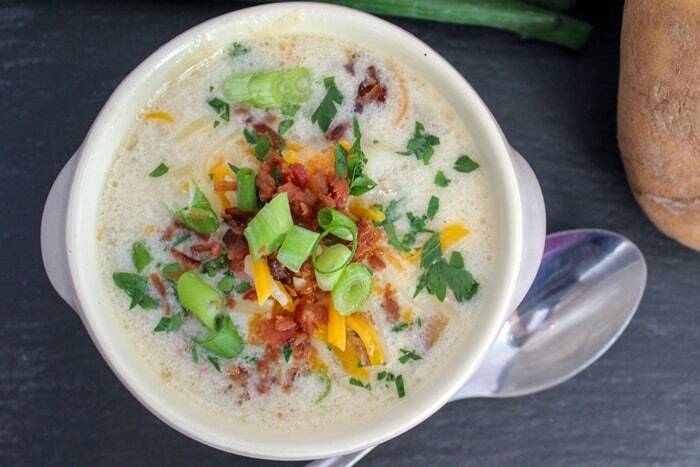 This looks so good, I love potato soup! I think I gotta get me an instant pot now.